Start the New Year off on the right paw—make a resolution to help your pooch shed some pounds if he’s overweight! Use these tips from a Waterloo veterinarian to help your dog slim down. Regular exercise is the best way for your dog to burn calories, effectively lowering his weight. Use toys or go out in the backyard for a run—however you do it, make sure your dog is getting exercise every day. More athletic dogs will enjoy intense games of fetch or tug-of-war, while some might stick to simply jogging alongside of you. Ask your vet what kind of exercise will be most effective for your pooch, as well as how long the dog should remain active per day. Don’t leave food out all day for your dog to snack on as he pleases—this is known as free-feeding, and it’s one of the leading contributors to pet weight gain. Instead, use proper portion control and only leave food out for a fixed period of time. Your dog’s food packaging should have a recommendation on the proper portion size for your dog based on size, breed, age, or other factors. You can also call your Waterloo veterinary professional to make sure. Dog treats can add up in the empty-calorie department, effectively packing on pounds to your pooch’s body. This year, try to cut back on the amount of treats you give your dog. Only give him one at a time when you’re rewarding him, and try using other methods of reward—verbal praise, petting, toys, etc.—instead of food when possible. Of course, regular veterinary visits are key to controlling your pet’s weight. 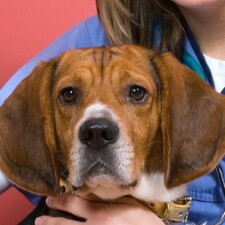 Set up an appointment to have your dog examined before you put him on a weight-loss plan. Your vet will work with you to decide on the best way to have your dog slim down. In addition, any other health problems that could be contributing to obesity will be caught and treated accordingly.